Lived c. 490 BC – c 430 BC. Empedocles lived 2500 years ago, soon after the dawn of scientific thought in Ancient Greece. In his remarkable life Empedocles devised a theory of natural selection; proposed that everything in existence is made of different combinations of four elements: air, fire, wind and earth; recognized that air has weight; said that the speed of light is finite; and made a statement equivalent to the modern law that mass is conserved in chemical reactions. 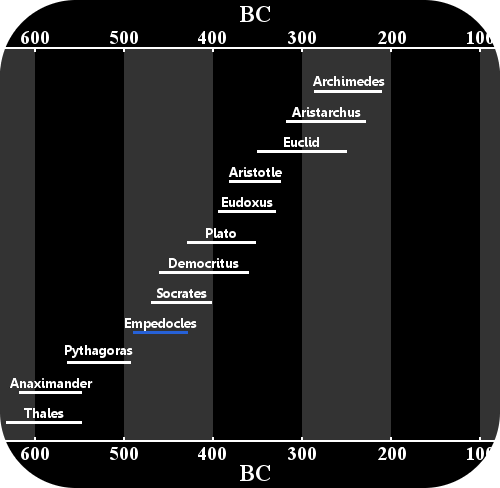 Empedocles was born 2500 years ago, in approximately 490 BC. Like many people who lived so long ago, details of his life are sketchy. Scholars rely on fragments from a variety of ancient sources to learn something of his life and his ideas. Empedocles himself tells us he was born in Acragas, on the island of Sicily, which was then part of Ancient Greece. Acragas was a magnificent city, culturally and financially rich. Empedocles’ family was well-known and wealthy. His grandfather, whose name was also Empedocles, kept racehorses. His father, Meton, was an Olympic Champion. Empedocles was educated by the Pythagoreans, who taught him that, on an intellectual level, numbers are the most important thing in the universe. All things could be reduced to numbers, which offered the perfect way of understanding the universe. It is unlikely that he ever met Pythagoras, who probably died a few years before Empedocles was born. Empedocles devised the theory that all substances are made of four pure, indestructible elements: air, fire, water, and earth. In one sense, it is admirable that Empedocles tried to simplify our complex world into basic elements. However, his four elements actually represented an increase in the number of fundamental substances. Thales, the first scientist in Ancient Greece (and quite possibly the world) had proposed about 100 years earlier that a single element – water – made everything. Then a relatively unknown philosopher by the name of Anaximenes proposed air, not water, was the basic stuff of the universe. Finally, yet another philosopher, Heraclitus, said fire was actually the true substance all others were made of. He believed everything in the universe was made of four elements, including living organisms. He also believed all matter, whether alive or not, was conscious. Rather mystically, he believed matter was held together by a fundamental force of the universe he described as Love and pushed apart by another force – Strife. Although mistaken, his four element theory proved to be remarkably long-lived. About a century after Empedocles devised it, Aristotle popularized and added to it. Empedocles’ four elements came to be known as the Aristotelian Elements. For over two millennia people believed these elements were the basis of all matter. The theory had incredible staying power. Eventually the work of rational, evidence-based experimenters such as Robert Boyle and Antoine Lavoisier relegated the importance of the four elements to a historical curiosity. Other scientists in the 1600s and 1700s had also made statements of mass conservation. Empedocles was the first person in history to propose that today’s life on Earth arose from a process we could describe as natural selection. In On Nature, he pictured Earth in its early days populated by bizarre creatures – cattle with human heads, arms without shoulders, and all sorts of other monstrous creatures. These strange lifeforms became extinct, Empedocles said, leaving the creatures we now see. Empedocles arrived at this rudimentary description of natural selection soon after the birth of science. He did not realize that natural selection might lead to the evolution of entirely new species. In his eyes it had operated in the past simply to remove freakish creatures. 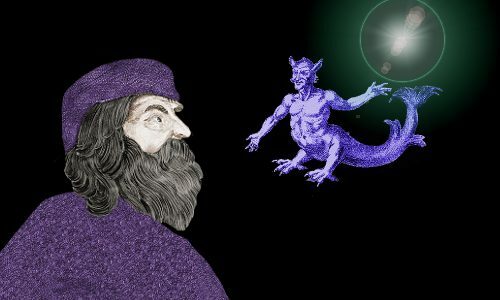 Rather than having modern-style thoughts about the speed of light, Empedocles might have been thinking more in terms of Zeno’s famous dichotomy paradox. The Greek philosopher Zeno lived at the same time as Empedocles, so his paradox would probably have influenced Empedocles’ ideas. In Zeno’s dichotomy paradox, you are trying to get to a destination. Clearly, you must reach the halfway point before you reach your destination. Having traveled halfway, you are still not at your destination. In fact, you now face a new, albeit shorter, journey in which you must still travel halfway before you reach your destination, etc, etc. Zeno’s paradox is that if you must always reach halfway points you will never arrive at your final destination. Thankfully, Empedocles did not tie himself up in the sort of knots Zeno delighted in. However, if Empedocles’ thoughts were in tune with his time, he might well have acknowledged that light coming from the sun must reach a halfway point before reaching the earth. This could be what he is suggesting in the quote above. Whatever his thought processes were, Empedocles was right – the sun’s light does not reach us instantly, and hence the speed of light is finite. Empedocles believed our senses do not reveal the whole world to us. There are things out there that our limited senses do not allow us to observe. It would be nice to believe he was thinking of ultraviolet or infrared light, but he wasn’t. He was, with commendable wisdom, simply expressing a general principle. In On Nature, Empedocles tried to explain breathing by comparing it to how a device for lifting water operates. Although his ideas about breathing were rather inaccurate, his description of the water-lifter has generated a good deal of interest. The clepsydra – the water-lifter. Empedocles described a girl playing with a clepsydra – a hollow metal sphere with holes punched in the bottom and a larger hole at the top which can be covered with a finger, as shown on the left. 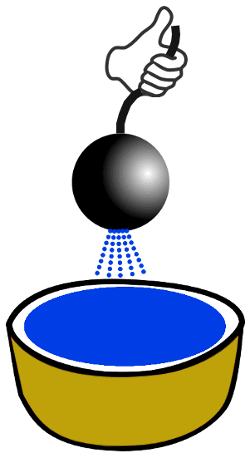 Empedocles noted that when the girl blocks the top hole with her finger, and submerges the vessel in water, no liquid enters. It is blocked by the weight of air in the clepsydra. If she then removes her finger, the compressed air is pushed out by the water rushing in. Likewise, he said that when the clepsydra is lifted full of water up into the air and the hole at the top is blocked by a finger, the air outside the clepsydra trying to get in keeps the liquid inside the clepsydra. When the finger is removed air rushes in and the water falls in a shower downwards. There are also claims that Empedocles was carrying out this ‘experiment’ trying to prove that air, although invisible, was a substance. In fact, it seems likely that his intended audience already knew air was a substance. Empedocles was actually using the well-known clepsydra and the (probably) equally well-known principle of how it worked to try to explain something more difficult – the process of breathing. We can therefore deduce that educated Ancient Greeks were happy with the concept of air as a substance. The fact Empedocles recognized that air has weight is historically significant. 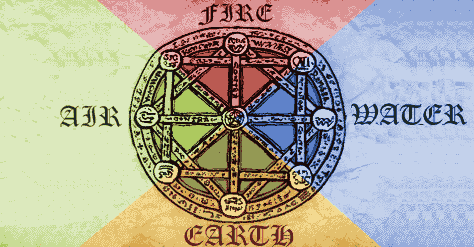 According to Empedocles, the four elements emerged from a vortex and condensed into the earth. Empedocles said the heavens are spherical and crystalline and revolve around the earth. The stars are patches of fire fixed to the sphere. Empedocles was in favor of government by democracy, and he is reputed to have been unenthusiastic about following rules made by other people. He was a vegetarian. He believed human souls could inhabit animals’ bodies, so it would be murderous and even cannibalistic to kill and eat any animal. This was a typical Pythagorean belief. Whether or not he actually believed he was a god is unclear. Perhaps it was poetic license? He may have been completely serious. Accounts say he was a solemn, dignified person, who was able to perform magic and heal the sick. Empedocles is reputed to have died when he threw himself into the molten crater of Mount Etna, the volcano that dominates Sicily. Accounts of this incident differ. Some say he did this because he did not want his body found, so people would think he had truly been a god. Or possibly he was trying to prove his immortality, and he actually believed he would return to his followers as a fully fledged god. Alternatively, and less dramatically, he did not jump into the volcano; he moved to the Peloponnese peninsula in southern Greece, where he died of an unknown cause. According to Aristotle, Empedocles died aged about sixty. Other ancient sources claim he lived to the age of 77 or 109. "Empedocles." Famous Scientists. famousscientists.org. 13 Nov. 2015. Web.